Trying not to look, but I can't help it. Are you watching the Victoria Beckham "Coming to America" reality show? Probably not, but really, you're missing something! It was like a train wreck; I couldn't turn away. She was hysterical! This photo is of the time when she was asked to throw out the first pitch at a Dodger's game. Damn it if she didn't find heels appropriate for the occasion! My favorite part was when she was at the DMV trying to get her driver's license and the guy behind the counter told her she needed to sign the form she had filled out and she thought he was asking for her autograph. Then, when she was taking her photo for her license, she was totally posing, wanted to take it over again, and then asked the DMV lady if they could re-touch the photo before they printed it. My new guilty pleasure. I will be watching again. Met a former co-worker friend for lunch today. Several months back (when we still worked together) we talked about what a great guilty pleasure Denny's is for both of us. Something we don't do very often, but when you do it, it is fun and you feel like you are getting away with something. 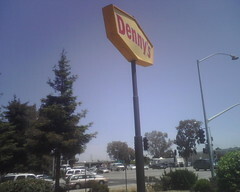 So on this beautiful summery day (in the 70's pushing 80) we drove in her convertible Miata down to the local Denny's (in Redwood City on Woodside Road near 101). This is no ordinary Denny's mind you. My lunch date, Christine, is quite the techie and she tells me that when Google bought YouTube, they signed the deal AT THIS VERY SPOT! AT DENNY'S! So there you have it. A bit of tech trivia for you on this beautiful Wednesday. What did we have, you may ask? Christine had a garden salad....and the bacon cheese fries! I had an Asian Chicken Salad with a side of really yummy buttery french bread style toast....mmmmmmmmm. And it was really yummy. And we had a great time! I've decided that I need a new bag. Something functional but with a lot of character. I don't want to spend a ton of money on it, all that you'll see below are way out of my league. But they are examples of what I'll be looking for when I go to Ross, TJ Max etc. Now, never mind the skeezer holding the bag...I like the color, the size and it has some adornments that give it character. I'm wondering if the handle is big enough to slide over my shoulder, however. This particular bag I found at Zappos.com for $236. On my recent trip to the Seattle area (Gig Harbor to be exact), I went to a wonderful little breakfast place in Tacoma with hubby's sister, step-mom, and two of his aunts. We brunched at the cafe on the second floor. One of Dan's aunts had the Green Eggs and Ham (Poached eggs with a yummy looking green sauce over them) and sister chose the "Full Monty" breakfast which was eggs, potatoes and your choice of meat (of course). The menu was clever and the food was delish. On our way out of the cafe, we all did some browsing and shopping in the cute store located just below the cafe. I lucked out big time when I found the most wonderful pair of socks I've ever seen/worn. Now, it isn't every day (OK, never) that I spend $18 on a pair of socks. But let me tell you this right now...THEY ARE WORTH EVERY PENNY. They are absolutely the best socks I've ever worn...and damn it, they are cute too! They are purposely mis-matched (cute, huh?). I highly suggest these to be worn around the house on cold days. Put on a fire and cozy up on the couch with a good book and these incredible foot adornments. 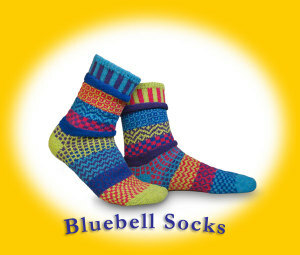 You can find other colors at The Sock Lady's website. Spend the $18 bucks, seriously...you won't regret it! I think Christmas shopping just got easier for me this year! Give me that which I desire. Rockin' out with friends to the Metallica/San Francisco Symphony concert on DVD. 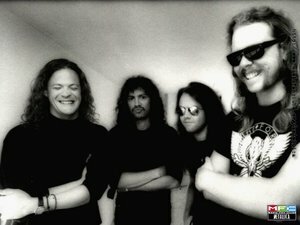 Master of Puppet, Fuel, whatever...with the symphony especially...they are F*CKING ROCK STARS! Brian, over at KRON 4 The Bay Area is Talking, made a brief mention that sent my mind reeling back to my early childhood (with some flashbacks to late night college days also). Lancelot Link, Secret Chimp. He was my hero. He made me laugh without fail. He just tickled my funny bone. Come to find out, you can buy a DVD of Lance Link shows!
" Dear Santa: I've been a very good girl this year (well, mostly, don't ask around too much). What I would really like under the tree this year is my very own Lance Link DVD. I must share this with my children. I must have Lance for myself." Thanks, Brian for that stroll down memory lane! My guilty pleasure de jour is Mr. Snoop Doggie Dog. Can't explain it, don't want to. Just dig him. He rocks and cracks me up.